Scion has sold 800,000 vehicles since the brand’s 2005 model year debuted, and the median buyer’s age is only 26—the youngest in the industry. 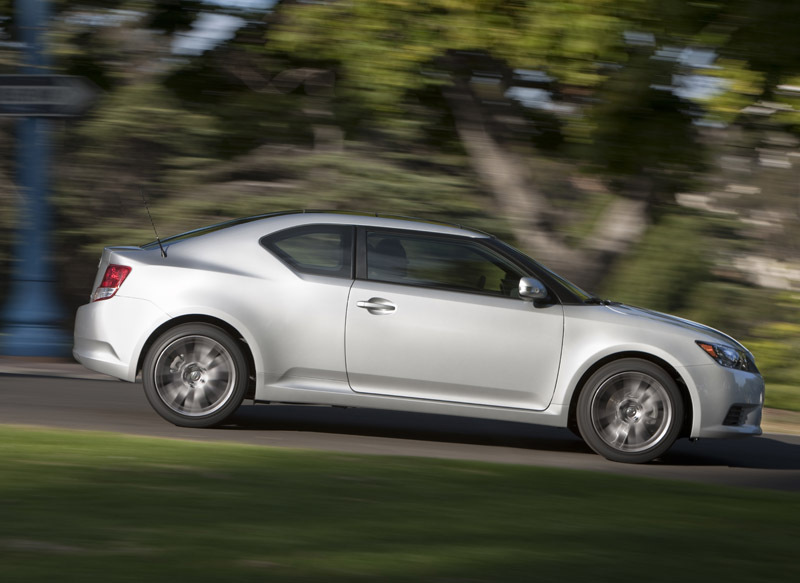 Of the models Scion has offered since then (xB, xA, xD, tC), the two-door tC has been the brand's bread and butter. In fact, Scion VP, Jack Hollis, said there are about 310,000 tCs on the road. The tC, however, has remained mostly unchanged since its debut. For 2011, the Scion's bread-and-butter tC gets more bread and more butter. There’s been an increase in nearly everything: horsepower, torque, fuel economy, performance, stereo watts, leg room, standard wheel diameter, weight, and price. The car gets new sheet metal, a new engine, new transmissions, a new interior, and the list goes on. So how has growing “up” changed the venerable two-door tC? I got a chance to drive two pre-production prototypes in San Diego to get a preview of the upcoming Scion coupe. The exterior definitely keeps in line with the previous tC: two doors, a sporty look, and a coupe shape (although, it’s actually a liftback). There is evidence of styling cues from the Scion Fuse concept car, especially the wide rear C pillars. This design element seems to be at odds with the rest of the body, as the jut at the C pillar looks too squared off for me. Scion has upped the standard wheel size to 18”x7.5” shod with 225/45/18 tires—impressive looking rolling stock, for certain. However, those living anywhere it snows will want to invest in a set of winter wheels and tires. (A 19" wheel/tire option is available, too.) The stock stance looks good, too, although like most cars, it’ll look even better if lowered. I think the most attractive part of the car is its rear, and the optional spoiler really sets the rear off. Overall, the car's look isn't exactly pulse-quickening, but it's not overly bland, either. Like the exterior, the interior is a bit of a mixed bag. The dashboard feels noticeably vertical, like something you’d find in an FJ Cruiser; I expected more of a wrap-around cockpit feel from a sport coupe. There is an excellent chunky steering wheel; supportive, well-bolstered seats; an attractive, easy-to-read set of gauges, and the panoramic glass roof. You’re surrounded by lots of hard, textured black plastic including a not-so-conveniently located hard plastic center armrest which was neither comfortable or well-placed—especially for those driving the manual transmission. The interior is surprisingly roomy, both in the front seats and the rears. Yes, four adults can ride comfortably in this vehicle. Plus, the rear seats recline 10 degrees for comfort. Those rear seats also fold down nearly flat for a cavern-like rear cargo area, too. Scion prides itself on its audio systems, and there’s good reason to. Both of the units I sampled sounded very good. There are three headunits to choose from. The non-navigation Alpine unit, however, was not easy to use, especially while driving. There is a touch-screen navigation option as well. The base stereo system has 300 watts, eight speakers, aux/USB, and sounds pretty good; the upgraded Alpine unit with subwoofer is outstandingly clear and balanced. 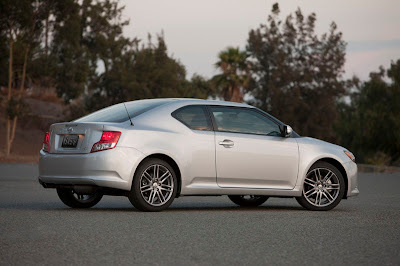 I first drove a tC with a manual transmission, outfitted with TRD accessories including larger front and rear sway bars and a high-flow exhaust system. The car is very easy to drive. Clutch uptake on the new six-speed is predictable; shifting is light, although throws are a bit long. Overall shifting operation is vague, though. The new electric steering feels slightly artificial and doesn’t provide much feedback—a Toyota trait lately. The car rides firmly but controlled on the highway. Once in the twisties, car remains planted—those swaybars and 225mm-wide tires undoubtedly help. Handling is predictable, but not overly sporting. The new 2AR-FE, 2.5-liter engine features dual VVT-i valve timing and is up 19 hp and 11 ft./lbs. of torque from the previous 2.4-liter mill. (Vehicle curb weight is also up 155 lbs.) Power is certainly adequate, but the car doesn’t feel like it makes 180 hp. Equipped with the six speed, the tC is certainly not a slouch, but it didn’t feel like it had a lot of grunt, either. Scion says 0-60 times are down more than a half second in the manual and nearly a full second in the auto (7.6 and 8.2 seconds, respectively). After driving the TRD parts-equipped tC, I hopped in a completely stock base tC with the new six-speed automatic, which now features manual shifting ability. 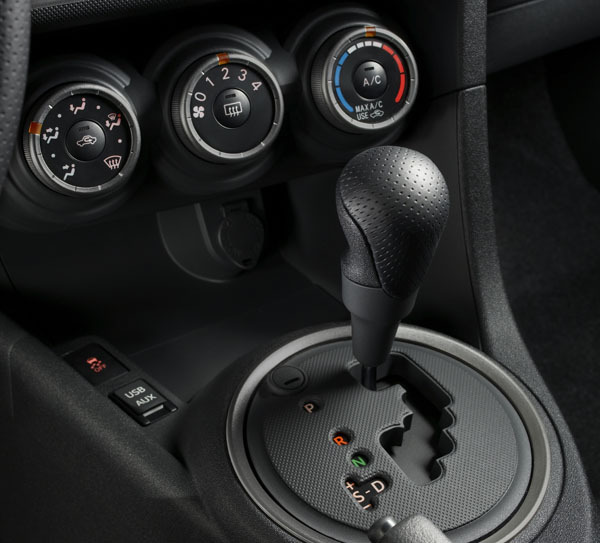 The new automatic shifted smoothly under all driving conditions. However, the manual gear selection was slow to react, and oddly, didn’t want to upshift under full throttle. I had to back off the throttle before it’d change gears. As expected, the all-stock tC unsurprisingly doesn’t corner as crisply as the model equipped with the TRD sway bars. But again, handling is still predictable but not overly performance oriented—I suggest buying the sway bars as a first accessory. But both the manual and automatic cars felt bigger and heavier than they were, especially during spirited driving. There was also a noticeable drone while at highway speeds. 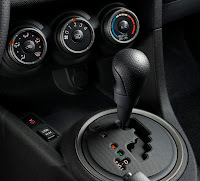 As with most automatic-transmission-equipped cars, acceleration was significantly slower than its manual counterpart, and this was exaggerated in the 96-degree SoCal heat with the A/C on. The 2011 tC didn’t strike me as a standout. The car was a bit vanilla, topped with just a bit of chocolate sauce on it. Of course, with the addition of TRD and Scion performance accessories, buyers will be able to add more sauce and extract more performance and style. Buyers can get into a base tC with a manual for $18,995; a base auto for $19,995 (including the $750 destination). Remember: Scion uses “Pure Pricing,” which doesn’t allow for any negotiation—great for those who don’t want to haggle. However, with the state of the economy, many brands are willing to negotiate to get you into a car, something that might hinder tC sales. For me, the 2011 tC falls slightly short. Its styling doesn’t stand out enough, its performance is not quite as strong as I’d hoped, and I think it’s priced a bit high. Yes, you get a lot of standard premium features, but the car as a whole is a bit underwhelming. It seems like every time Scion comes out with a new model, the looks are highly debated. I hope for the sake of Scion, that this new tC will sell as well as their first gen model. Kia Forte Koup or Scion tC? Personally, I prefer the Koup. (Sorry for the uber-late response) However, both are nice vehicles, and the tC is definitely worth a look.